As spring approaches, many people are swapping out their winter wardrobes in hopes of warmer weather. Although the urge to shed our coats and jackets may be strong as we dream of the trees blossoming and flowers blooming, that doesn’t mean we must ditch outerwear completely. Blazers and dusters can roll from one season to the next, but so may a good jacket depending on the climate where you live. Whether you’re looking for some options that are lightweight and easy, stylish and functional, or edgy with some elegance, we have collected some of our favorites. Between Oska, Péro, and Annette Görtz, there are more than enough linen jackets to go around. Oska has a few to offer, from this neutral colored jacket to a longer silhouette in navy tones. Péro has a number of outerwear pieces created with linen, many of which are detailed with stripes which we have discussed in our previous style report. And although Annette Görtz has only a few jackets available at the moment, there is no shortage of lovely neutral toned items in our store. In some ways, Etro and Sacai are often associated with vastly different styles. Sacai has an adventurous and experimental reputation, while Etro produces work that is closer to a classically beautiful and ornamented style. Though when displayed next to each other, Sacai’s denim bomber jacket looks just as artful as Etro’s patchwork coat. Studio B3 and Rundholz are similar in not only their color inspirations for this season, but the essence of their clothes speak well to one another. 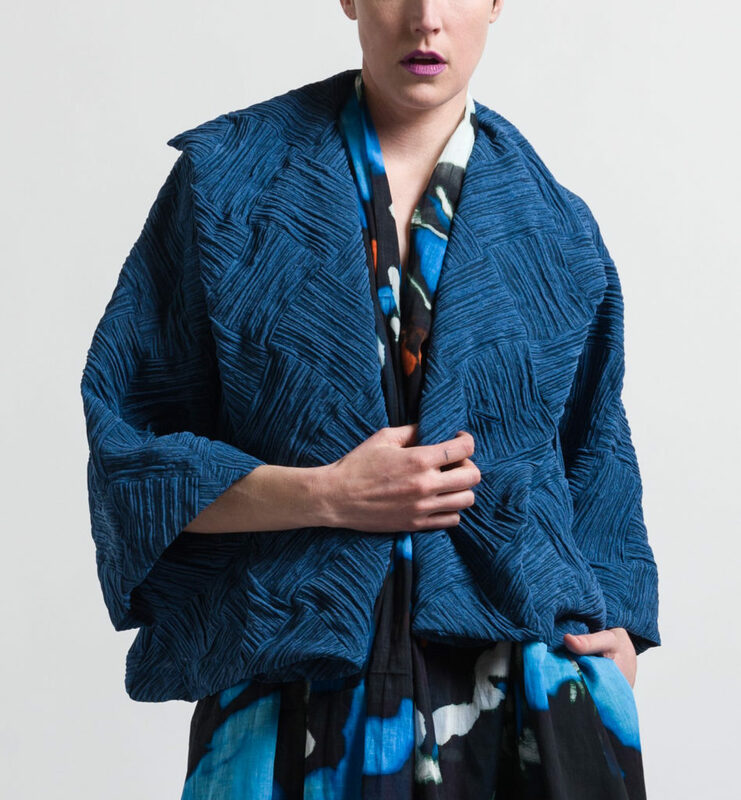 Many coats in Rundholz Dip are detailed with frayed details, woven fabric, and ruching. In the same way, Studio B3 is a firm believer in letting the textural qualities of fabric shine, which is why they advocate against ironing their clothes and have detailed many hems with raw edges. From brilliant tailoring to luxurious fabrics, these jackets have it all. Shi exhibits excellent choices when it comes to material, and this devore jacket is no exception. With strikingly textured paisley and floral print, they have achieved a comfortable elegance. Similarly, Peter O. Mahler has crafted a jacket with structured shoulders and a jacquard floral print. Etro as always, is beyond words, due to the fit of this jacket coupled with the fabric and pattern. Whether its a windbreaker or a lightweight parka, Marni and Rundholz Black Label have all the jacket options one could ever need when looking for a casual yet stylish piece of outerwear. Avant Toi, A Tentative Atelier and Ümit Ünal are an interesting group. Each have taken inspiration from classic silhouettes and added elements that are not typically associated with such sophisticated garments. With Avant Toi, blazers that are often traditionally sleek have been stitched from hemp and dyed with variances in tone, making it less than uniform. A Tentative Atelier’s take on the typical blazer is detailed with a raw hem, as are Ümit Ünal’s jackets, both of which remain refined.